Ari Folman, the Academy Award-nominated director of the 2008 film Waltz with Bashir, is completing production of an animated film on the life of Anne Frank. Details of the upcoming feature film, titled Where is Anne Frank? were unveiled last week at the Cartoon Movie forum in France. Variety reported on Monday that a session on the animated movie was one of the most attended overall at the industry gathering. At the event, Folman explained that he was originally reluctant to tell the story through animation because of its dark psychological themes, according to Variety. To overcome that, he said, he decided to tell the story through the eyes of “Kitty,” Frank’s imaginary friend, to whom she addressed her diary entries. In the film, Variety reported, Kitty wakes up in modern times, and imagines that if she’s alive, Anne must be as well, and so she sets out to find her. According to Animation Magazine, Folman said that he first thought about the film after he reread Frank’s original diary for the first time in decades. He and illustrator David Polonsky recently turned the diary into a graphic novel, published in collaboration with the Anne Frank Fonds Foundation. The film began production last year in Folman’s animation studio in Jaffa, and was created in partnership with production houses in Belgium, Luxembourg, France and the Netherlands. According to Animation Magazine, Folman said the 92-minute film has been completed and the voices have been recorded in English. Folman said he agreed to do the film under two conditions, according to the magazine. FRIEDMAN: WHY CAN’T ANTISEMITISM BE REJECTED IN HALLS OF CONGRESS? 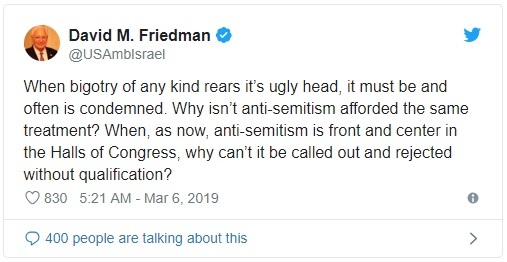 Posted on March 11, 2019 in: Jerusalem Post|Comments Off on FRIEDMAN: WHY CAN’T ANTISEMITISM BE REJECTED IN HALLS OF CONGRESS? US Ambassador to Israel David Friedman weighed in on the recent antisemitism controversy on Capitol Hill stirred up by Congresswoman Rep. Ilhan Omar’s public remarks. More than 100 people took Dublin’s streets on Sunday in opposition to proposed legislation whose goal is to boycott products made in the West Bank. Sunday’s marched was organized by attorney Nati Rom, founder and director of the Lev HaOlam organization, which works to fight against the global boycott of Judea and Samaria. It was co-organized by the Ireland Israel Alliance. The march took place on Dublin’s main road. Participants chanted Am Yisrael Chai. “We are happy to see the tremendous support we received from all the people who marched with us and took time to express their support and solidarity with Israel,” said Rom. He said that in places where pro-Boycott, Divestment and Sanctions groups have significant influence and power, as in Ireland, it is important to show that there are still many supporters of Israel. (JTA) — If you walk into any wealthy Jewish American neighborhood, a careful eye will spot designer duds – Gucci, Prada, Louis Vuitton – sported by well-coiffed men and women as they walk through town. But in a sea of expensive excess, one designer’s name is spoken of with an air of reverence: Chanel. It is a brand that can at once whisper and scream one’s bourgeois status. The boxy tweed jackets and white camellia flower pins are logo-less signatures that boldly state their coveted designer status without saying (or, in this case, embroidering or printing) a word. It’s that unique mix of modesty and immodesty that makes Chanel a household name among Orthodox and secular Jewish women alike. Chanel provides bewigged and be-hatted Hasidic women with stiff, below-the-knee boucle skirt suits while simultaneously appealing to the languorous Long Island crowd with its less understated interlocked “CC” logo branded crop tops and chokers. Not only was she in bed with the Nazi cause, but there is strong evidence to suggest that she actively worked for the Nazis as a secret agent. And yet it was a wealthy Jewish family, the Wertheimers, who helped finance her prolific rise and still control the company today. And it was Karl Lagerfeld, who died Tuesday at age 85, who has made the brand so iconic and polished that it was easy to forget everything problematic about Chanel herself. In 1924, the Wertheimer family provided financing to produce Chanel’s first and most iconic fragrance, Chanel No. 5, in exchange for a 70 percent share of the perfume division of her company. Theophile Bader, the Jewish businessman who introduced Chanel to Pierre Wertheimer at a racetrack, received an additional 20 percent as a finder’s fee, leaving just 10 percent for Chanel herself. Chanel was not involved in the production of the perfume, but she soon came to resent the agreement, both because of her latent antisemitism and the financial success of her perfume business. Chanel began trying to take back control of her company, unsuccessfully suing the family enough times that the Wertheimers reportedly had a lawyer dedicated solely to dealing with her litigious efforts. Before the Nazis invaded France, the Wertheimers escaped to family in New York. Nazi laws forbade Jewish ownership of property and businesses, and in 1941, after Germany invaded France, Chanel petitioned the Vichy government and Nazi officials for sole ownership of her perfume company. But even that effort proved fruitless — the family, knowing Chanel’s obsessive desire to take control of her perfume business and the Nazi anti-Jewish laws that were already in effect in Germany, took steps to ensure that would never happen. The Wertheimers bequeathed full control of their stake to a French Christian businessman named Felix Amiot, himself a collaborator who sold arms to the Nazis, for the duration of the war. Chanel, for her part, would go on to spend the rest of the war years as the lover of Nazi officer Hans Gunther von Dincklage. But she was more than just a passive paramour. According to journalist Hal Vaughan in his book “Sleeping with the Enemy: Coco Chanel’s Secret War,” there is evidence that Chanel was an active Nazi intelligence operative. Despite her involvement with Nazis and her underhanded tactics to usurp the Wertheimers’ control of her company, about a decade after the war the Wertheimers – in a move that was part business, part turning the other cheek – helped Chanel re-establish the House of Chanel (which had ceased operations after the Allies invaded France and Chanel moved to Switzerland), even going as far as financing her daily living expenses and paying her taxes for the rest of her life. It was in her unrepentant postwar years that Chanel really established what would become the design signature that Lagerfeld would later reinvent and recycle again and again until it became almost comically repetitive – the boucle jackets, the flat-topped wide brimmed hats, the pencil skirts and the pearls. Following Chanel’s death in 1961, the brand languished, searching fruitlessly for an appropriate successor who could be trusted with continuing her legacy. It was only in 1983, 22 years after Chanel died, that a young Lagerfeld – by then already known as a fashion wünderkind – was tapped to head up the languishing Chanel house. He was chosen because of his acknowledged creative genius, as well as his innate understanding and respect for what Coco Chanel had created, and had proven his chops while establishing the heritage French brand Chloe as an “it” brand that embodied the bohemian sensibility of the early ’70s. Lagerfeld’s first couture collection played on the tight-and-trashy look that was in vogue in Paris at that time – a trend that Lagerfeld had helped shape before he was tapped to helm Chanel. The skirt suits were slimmer and sexier and worn with wide obi belts; evening dresses were flounced and tiered and topped with tulle boleros; gems were sewn onto a dress bodice as a trompe l’oeil of a necklace; white pique four leaf clover flowers were pinned onto the shoulders of suits. This debut collection for Chanel received mixed reviews. Some believed the Chanel brand should have died with its founder, since she and her aesthetic were irreplaceable, while others thought that Lagerfeld’s touch paid proper homage that also showcased how he would shape the brand in the years to come. It was the latter opinion that proved to be the most accurate. That initial couture collection, with notes of verve and excitement usually reserved for ready-to-wear collections, was a success, setting in motion a lifetime contract with Chanel. Within a few seasons of his tenure, Chanel became the most exciting and coveted ticket at Paris Fashion Week. The shows were theatrical, the clothes were at once experimental and traditional; both fashion-forward and classic. Over the years, Chanel shows – mostly housed in Lagerfeld’s favored venue of choice, the Grand Palais – became grand productions where a runway could become a dreamy beach, a swanky airport, a French bistro and once even a supermarket in which every product bore the Chanel name and models carried grocery baskets edged in Chanel’s signature braided bag chain. Under Lagerfeld, Chanel could appeal to a multitude of clients: old and young, staid and trendy. His expertise in taking the classic Chanel tropes, like the camellia and the tweed boucle, and reworking them into the trend of the day – whether that be logos or micro-minis – made the Lagerfeld name synonymous with Chanel. With his hauteur demeanor and rarely changing personal aesthetic – gloved hands, sunglasses even indoors and hair tied in a Beethoven-esque low pony – Lagerfeld wasn’t just the designer at Chanel; he was Chanel. But Lagerfeld’s greatest service to the Chanel brand was his ability to erase the negative associations with Chanel, including the founder’s anti-Semitism. In fact, his contribution to the brand’s aesthetic and ethos was so extensive that his work often eclipses that of Coco Chanel herself. Many books written about the Chanel collections over the years often overlook the early years pre-Lagerfeld (much to the chagrin of Amazon book reviewers). Indeed it was only in recent years that the depth of Chanel’s involvement in Nazism has come to light. Lagerfeld made the brand so iconic and inclusive that it was easy to forget everything that was problematic about Chanel herself. But what Lagerfeld created in the Chanel brand is so iconic, so overwhelmingly representative of wealth and luxury, so removed from controversy and politics (even a runway show dedicated to feminist slogans and protesting felt excessively bland because it lacked edge or controversy), that even Lagerfeld’s most problematic moments somehow got excused and pushed aside — that is the power of Lagerfeld’s Chanel. But now that Lagerfeld is dead, the future of Chanel is again in peril: Who can replace a man who was such a virtuoso that he made Chanel into the most important, most recognizable brand – both in name and aesthetics – in fashion today? Let’s just hope that Chanel doesn’t languish for decades once more as the company searches for a designer who can respect and understand Lagerfeld’s vision, even as she or he remakes the brand in his or her image.